What types of activities can I see? 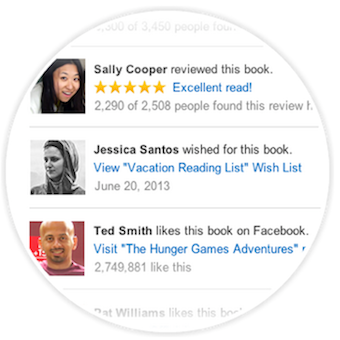 By connecting your Facebook account to Amazon, you can see when your friends have liked, reviewed, or wished for an item you're looking at. Similarly, your friends can see your Facebook profile picture and name when browsing items that you reviewed or are on your public Wish Lists (private Wish Lists will remain hidden). Will my shopping history remain hidden? Yes, your and your friends' browsing activities and purchases will remain private, and none of your Amazon activity will be automatically posted on Facebook. How do I change my settings about this? You can always opt out of this feature or manage your connection preferences from your Social Settings page. Digital List Price: $3.33 What's this?